Armenians rallied on February 5 to protest against the price hike for major consumers products in the country. In the very beginning of 2018, the Armenian authorities made amendments to the Tax Code of the country and increased excise taxes, which lead to a considerable increase in the prices for gasoline, gas and diesel fuel. Consequently, the prices for food products, such as meat, vegetables, dairy products, cheese, eggs, went up. All this caused a serious concern of the Armenian population. The resentment resulted in a massive rally on January 19 in the capital Yerevan. 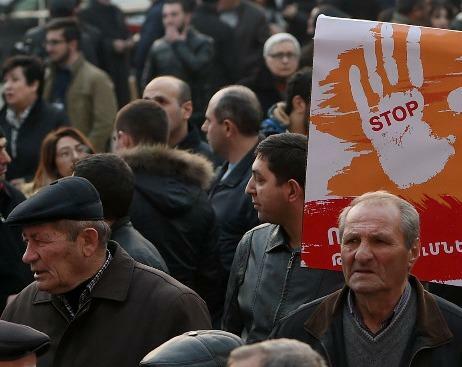 Seeing no concern of the authorities about the problem, the Armenian opposition bloc Yelk held the second protest against the [rice hike on February 5. Addressing the protestors, Yelk MP Edmon Marukyan said that the recent parliamentary hearings on the price rise did not actually soften the price increase, but were simply mockery. “Our authorities are inadequate and completely detached from the lives of citizens. By their unity, people must put the power in its place,” Armenian media quoted Marukyan. Another MP Aram Sargsyan, in turn, noted that the problem of price increases primarily concerns the government, the viability of the economy. He said that if the current policy of the government continues, the emigration rate will not decrease and the economy will not recover. “Armenia needs a miracle,” Sargsyan added. The MP added that despite the claims of fighting corruption, theft continues. Armenia, he said, needs the development of the IT sphere, mining industry, and investments. “The robbery cannot last forever – one day the resources will run out,” Sargsyan warned. The economic problems of today’s Armenia are caused by several reasons – monopolization, corruption, theft, fraud and unemployment. Obviously, all of these issues stem from the government of the country, which is directly involved in robbing the country’s treasury and population. Therefore, Armenians should expect no improvement of their country’s economy and social life while the current authorities remain in power. What Sargsyan's decade-long presidency brought to Armenia?